Speaking of Vienna, it's classical music. Specially famous for classical music and opera, however, ballet is hot in Vienna too. Since The Manuel Legris, a star dancer from Paris Opera Ballet became the director of Vienna State Ballet, the ballet company is watched by the world. His new production "Le Corsaire" had drawn many people's attention. The ballet was on when I was staying in Vienna, so I couldn't miss it! We went to the Opera House as soon as we arrived in Vienna. 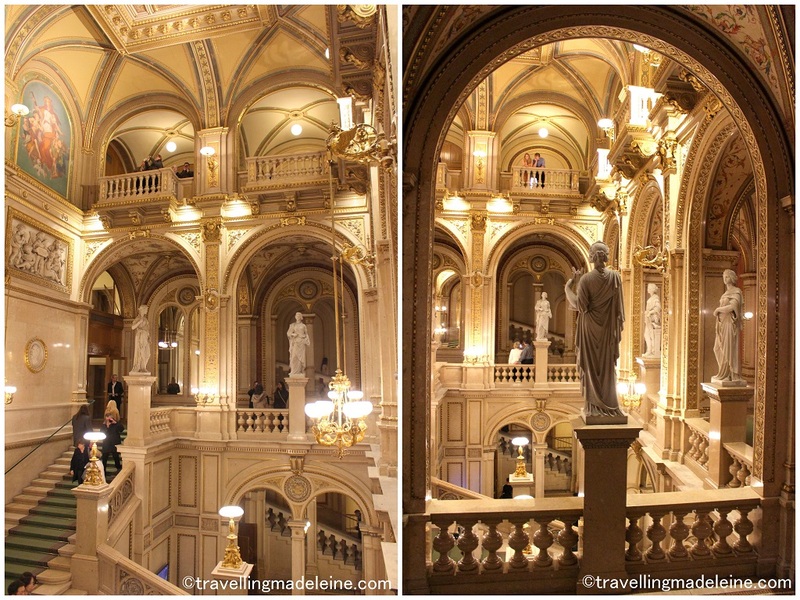 Vienna Opera House is based on white, so looks more pure and elegant. Their staircase was amazing too. The bar was absolutely stunning. You can go out on the terrace and see lovely night scenery from the top. The seats area was quite simple. This is the view from my seat. It was the top balcony seat, but not bad view as the stage was not so far! It's an entertainment rather than artistic, so it was quite rare to see whole act. However, recently many ballet company reproduce this ballet. English National Ballet also made a new production of Le Corsaire. The highlight of this ballet is the super technique dance, and also you can compare with other productions as this ballet has lots of variations in each ballet company. As my review contains the detail of the ballet, I will write it below with cast list. During my stay in Vienna, there were 2 performances of Le Corsaire, on 14th and the other date. That day has a guest artist from Royal Ballet, who was Vadim Muntagirov. So I decided to see it on 14th as there was my favourite dancer Nikisha Fogo was cast as Gulnare. However, she got injured and the cast was changed! It was very sad, but I hope that she recovers as soon as possible. Legris' Le Corsaire starts from the scene of the kidnap of Medora and Gulnare. I had never seen such a scene in other productions, however, the biggest difference was, there is no Ali in this production. Actually, Ali is not very important in the story, but he has the most famous variation in whole act. So Conrad dances his variation instead. Also Legris changed the famous Odalisque pas de trois. He changed the music, therefore, the choreography is totally different from the classical version. Also he added a pas de deux in the bedroom scene. Her Medora was so adorable and had aura. She's got technique and beautiful body line too. Another dancer I was impressed was the third odalisque. To be honest, I preferred the classical version music and choreography. However, in her variation, she showed beautiful 6 o'clock balance, it was unforgettable. Speaking of male dancers, the dancer who left the biggest impression on me was Birbanto. Birbanto is a character role and he doesn't have a famous variation and pas de deux. However Richard Szabo had sharp movements and stood out the most.